Heralding a new era in satellite navigation, Russian carrier rocket Soyuz-FG today launched the first 600kg Giove-A satellite of the European Global Positioning System Galileo from the Baikonur cosmodrome (Kazakhstan). The Opposition leader in the National Assembly and MMA Secretary-General, Maulana Fazlur Rahman, says seminaries’ management will prefer to court arrest instead of handing over foreign students to police. The deadline for expelling the students is December 31 and the government has not yet extended it despite talks on the issue with the managements of seminaries. The Canadian Sikh community has donated $2.3 million for setting up a new hospital here during a fundraising event through Punjabi community radio programmes. The money will be spent on building the William Osler Health Centre Foundation’s Brampton Hospital at Bovaird Drive and Bramalea Road, which is scheduled to open in 2007. A doctor of the Indian origin facing charges of using insecticides and unauthorised drugs to treat cancer patients has been released on a $ 1 lakh bond after he pleaded not guilty in a federal court in Atlanta. The World Bank-appointed neutral expert on the Baglihar dam issue has extended by a month the December 31 deadline given to Pakistan to answer technical questions on the hydropower project. Pakistan has once again linked the extension of most favoured nation (MFN) status to India with the progress on political issues, particularly Kashmir. Pakistan has notified the control lists of goods, technologies, materials and equipment related to nuclear and biological weapons and their delivery systems, which will be subject to strict export controls. If your sibling has heart disease, then there’s an increased chance of your getting it, says a study. An Indian mathematician has been named the co-winner of the King Faisal International prize for 2006, in recognition of his path-breaking research which has strengthened links between mathematics and physics. Twenty Iraqi detainees and a warder were killed today in a failed breakout from a Baghdad prison, an Interior Ministry official said. The USA has confirmed that it has imposed sanctions on nine foreign companies, including two Indian firms, for allegedly selling Iran hardware or ingredients used in the making of weapons of mass destruction. A Dubai-based Indian journalist has won the prestigious Arab IPR Media Award 2005 for his reportage on anti-piracy drive in the Arab world. Saudi security forces killed a suspected top Al-Qaida militant today, a day after he escaped clashes in which another militant and five policemen were killed, a security source said. It brought the GPS spacecraft to a preset circular orbit at 1201 pm (local time), with an altitude of more than 23,000 km and inclination of 56 degrees. 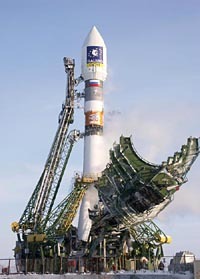 The booster was launched at 8.19 am (local time), Itar-Tass reported. The satellite is expected to demonstrate key technologies required for Galileo, the $ 4 billion sat-nav system Europe hopes to deploy by 2010. If successful, the satellite will mark a major step in Europe’s biggest ever space programme, involving firms such as European aerospace giant EADS, France’s Thales and Alcatel, Britain’s Inmarsat, Italy’s Finmeccanica and Spain’s AENA and Hispasat. The system will be organised as a public-private partnership, with the commission wanting two-thirds of the funding to come from the industry and the rest from public coffers. The Maulana, who is also president of his own faction of the JUI which runs several seminaries, announced that ulema would not inform their respective area’s police while moving out of the station. He was speaking at a press conference here on Tuesday. “We’ll do our best to keep the students with us and shall prefer arrest over giving the foreigners to police,” he vowed. He blamed Gen Musharraf for violating the UN charter as well as the Constitution by forcing the students out though they had neither been involved in any case in their country of origin nor here. Even the USA and the UK, direct victims of the 9/11 and 7/7 terror attacks respectively, did not take such a harsh step of banishing the students belonging to the countries of the suspects involved in the terror acts, he said. Maulana Fazlur declared that no scholar would be bound to inform his respective police station while leaving the area for any reason, as demanded by the government. The Canadian Sikh community has donated $2.3 million for setting up a new hospital here during a fundraising event through Punjabi community radio programmes. The money will be spent on building the William Osler Health Centre Foundation’s Brampton Hospital at Bovaird Drive and Bramalea Road, which is scheduled to open in 2007. The fundraising event, Better Health Radiothon, was organised from November 15 to 24. During each programme, radio broadcasters discussed the importance of the new hospital with local residents and appealed for support. “It truly was a tremendous outpouring of generosity from listeners in the Canadian Sikh community. Word spread quickly and we have had inquiries about support for our new hospital from as far away as Vancouver and Texas,” Maureen Flanagan Pool, director of development and new initiatives for the foundation said. “We had calls coming in from across the Greater Toronto Area and from as far away as London, Cambridge and Ottawa,” Pool added. The radio centres to take part at the fundraising event included — Asian Connections Radio, Mehfil Radio, Nirwar Radio, Pardesi Radio, Parvasi Radio, Radio Punjab, Sargam Radio, Sur Sagar Radio and Surtal Radio. Totada R Shanthaveerappa, who was indicted by a federal jury on 87 counts last Thursday, and his assistant Dan Bartoli were released yesterday on separate bonds of $ 1 lakh by a court in Atlanta of George state. The pro appeared in the court four days after the license of the 70-year doctor, also known as T R Shantha, was suspended by the State Medical Board saying his continued practice of medicine poses a “threat to public health, welfare and safety”. The suspension came after a grand jury had indicted him on several charges including money laundering, insurance fraud and prescribing unapproved drugs. Neutral expert Raymond Lafitte extended the deadline because Pakistan “did not” receive some technical data from India, which was imperative to prepare replies to certain technical questions, official sources said here. However, Pakistan had received most technical data on the project from India, they said. The neutral expert had on October 19 convened a meeting of Indian and Pakistani officials in Geneva where the two countries were given the technical questions about design standards for the hydropower project. “The neutral expert is likely to convened the next meeting some time in the last week of January or the first week of February,” the sources were quoted as saying in Pakistani daily “The News”. Lafitte was appointed neutral expert for the 450 MW power project in May by the World Bank after Pakistan said the construction of the project violated the 1960 Indus Water Treaty. Meanwhile, sharply reacting to India’s comments on the situation in Balochistan, Pakistan said today it was “unwarranted” and tantamount to interference in its internal affairs and “contrary” to efforts aimed at bringing peace and stability in South Asia. “We are in process of a composite dialogue with India on both trade and political issues, but Pakistan will not give MFN status to India unless visible progress is made on political issues between the two countries including Kashmir issue,” Commerce Minister Humayun Akhtar Khan told mediapersons here. The minister, who attended the recent WTO round of talks, said despite the no MFN status to New Delhi by Islamabad, the trade between the two countries was in favour of India because of Pakistan’s liberalised tariff regime. However, Pakistan’s exports to India are not flourishing despite New Delhi’s MFN status to Islamabad. He said the main hurdle in the enhancement of exports to India was its restrictive tariff regime and non-tariff barriers. The control lists have been notified pursuant to the ‘’Export Control Act on goods, technologies, materials and equipment related to nuclear and biological weapons and their delivery systems’’, which was adopted by Parliament in September 2004, a Foreign Office statement said here. This is a higher risk than if your parents have heart disease, says the study published in the latest issue of the Journal of the American Medical Association. Researchers led by Joanne M. Murabito compared the occurrence of heart disease in about 2,475 people with and without siblings over eight years. This new study shows that having a brother or sister with heart disease is a significant independent risk factor, reported health portal HealthDay News. Murabito said: “We found that participants who had a brother or sister with cardiovascular disease had higher levels of risk factors compared with participants who had a sibling without the disease. “In addition, participants with a brother or sister with cardiovascular disease had a 45 per cent increased risk for the disease.” The known risks for heart disease include family history of the condition, age, high blood pressure, high cholesterol, overweight, current or former smoking, physical inactivity and diabetes. The increased risk appears to be attributable to a combination of genetics and childhood environmental exposures, the study found. Murabito believes that people should know if their siblings have heart disease and be aware that their own risk could increase. She said: “It is important for physicians to collect a family’s medical history. “It is important to consider sibling cardiovascular disease history when looking at people with elevated levels of risk factors. “Although you can’t change your family, you can modify many lifestyle-related risk factors for heart disease. India’s M S Narasimhan, an honorary fellow at the Tata Institute of Fundamental Research in Mumbai, shares the prize with UK’s Simon Kirwan Donaldson, president of the Institute of Mathematical Sciences and professor of mathematics at Imperial College, London for seminal contributions to math which also helped provide a foundation for physical theories. Prince Khaled Al-Faisal, director general of the King Faisal Foundation, said the prizes would be distributed to the winners on February 18. Prisoners stole a weapon from a guard at an Iraqi detention facility in the northern Shiite pilgrimage district of Kadhamiyah, before shooting dead one prison officer and wounding another. Guards then opened fire on the detainees, killing 20, the official told AFP. Many of those detained at the facility are held on terrorism charges. US State Department spokesman Adam Ereli yesterday said sanctions had been applied to six Chinese firms, two Indian firms and one Austrian company as reported earlier in the day by the Washington Times. Both Indian companies were chemical exporters. The Austrian firm, Steyr-Mannlicher, is a well-known maker of advanced assault weapons. He said there was a credible information showing the companies had transferred equipment or technology that was barred from going to Iran. The year-long sanctions blocked the firms from doing business with the US government or obtaining American hi-tech products. Isaac John of ‘Khaleej Times’ won the award for his “insightful reportage about the challenges and opportunities in forging an effective anti-piracy drive in the Arab world”. The award was constituted by Business Software Alliance (BSA), a global organisation dedicated to promoting a safe and legal digital world, Co-Chairman of BSA (Middle East) Jawad Al Redha said. John — a veteran of 25 years in Gulf media — has won three Pan-Arab awards in a row in 2005, a rare distinction for an Indian journalist in this region. “Abdulrahman al-Motaeb, 26, who figures number four on a most-wanted list was killed this morning in the desert,” the source told AFP. Another suspected militant, Mohammed Abdul Rahman al-Siwailmi, died of his wounds early today after being hit in yesterday’s clashes with the security forces near Buraida, capital of Qassim province, 300 km north of Riyadh, according to the Interior Ministry.